Almost two years ago, now, my husband and I came to a point where we decided that we’d like a bit more space to live our lives. I’m not sure if it was the neighbor ratting us out for our illicit chickens, the waking up repeatedly to flashing lights in the windows as local police visited the house around the corner. Again. Or the feeling of constriction of not being able to use our little yard the way we’d like. My two daughters are on the Autism spectrum, and not aware enough of danger to be allowed to play outside without really close supervision – very nearly hands on. We had a few notices stuck to the door by the city regarding various “infractions” of ordinances. Even when all we really have are two small raised beds for herbs and veggies. The time had come to seek out something more. Neither of us are city people to start with. He grew up on a small farm in western Illinois. I grew up in a more sprawling suburb in central Michigan – with frequent trips to grandparents’ farms. We’d try the “soccer mom” life and it was not for us – especially with kids who weren’t on the dance/sports/hand out with friends carousel. Unfortunately, finding our “bit of earth” was more difficult than we’d anticipated. First we explored the few listings that were available that matched or came close to what we wanted: around five acres, some woods and some cleared. That added up to just a few parcels, all of which had some drawbacks – mostly still being a little too close to town, in a township whose zoning ordinances had the potential to still give us trouble. Then I got a bright idea. I fired up the GIS (Geographic Information Systems) map for my county. This allows you to see ALL the parcels in the county of interest. When you click on one, you can get information about its size, zoning, and the contact information on the legal owner. I started marking likely-looking properties – no buildings present, the right acreage, the right school district, and hadn’t changed hands in the last 12 months, or so. We spent a lot of time driving around looking at parcels and taking family walks down country roads. We did really prefer to be somewhere with natural gas available at the street, along with electric and cable. So, some of this was to look for the flags that mark natural gas lines and some to look over the property in general. Next, I started my letter-writing campaign. I bought several packages of blank notecards in cute designs with colored envelopes – the kind that look like a baby shower invitation or a thank you note from the outside. Then I handwrote a note to the owners of the parcel we were looking for, talking about what we wanted to do and asking if they had any interest in selling the parcel in questions, and ending with contact information for both my husband and myself. We got near a 30% response rate. And, if you’ve been in sales, you know that’s pretty good for cold calling. Now, sometimes the response was “we’re not interested,” and sometimes it was for sale – for an outrageous amount of money. We even got good enough at google-stalking to find phone numbers and follow up with a call. One parcel was intended for its owner’s retirement home. Another was a “private hunting reserve.” Yet another has a long story I might tell someday about an ex-athletic star from my alma mater, a fast-food empire, and 80 acres in the wilds of West Michigan that his wife still doesn’t want to sell even a corner of. Some properties we got permission to walk. Some of them even got names. “Narnia” was down a beautiful private road with an ornate lamp post at the end that we found in the winter. “Pooh corner” had a fabulous giant beech tree on the edge of a gorgeous meadow. Don’t name things. You get emotionally attached, and then can’t get the owner to make a deal. Also, keep in mind that people can be wildly unreasonable. If you hear the words “I gotta get $X out of it,” walk away. You’re dealing with someone who doesn’t understand that his or her financial condition has zero bearing on the worth of the parcel in question. If you’re talking to someone who is proposing a division that is clearly contrary to the local zoning ordinance – walk away. Most often they’re convinced they can get the zoning board to make an exception. Hint: they can’t. We began to despair entirely until we finally got a phone call back from the elderly gentleman who owned 10 acres of… brush. Or so it seemed from the road. In fact, he’d planted 3-1/2 acres of it in black walnut trees when he first bought it. But now, it was too far away from where he was living and he wasn’t able to keep up on it. None of his children had the means or interest to buy it. So maybe it was time to sell. With his permission, we managed to cut a trail into the property from the road, so that we could access it. The walnut trees form most of the Eastern and Northern boundaries of the parcel. 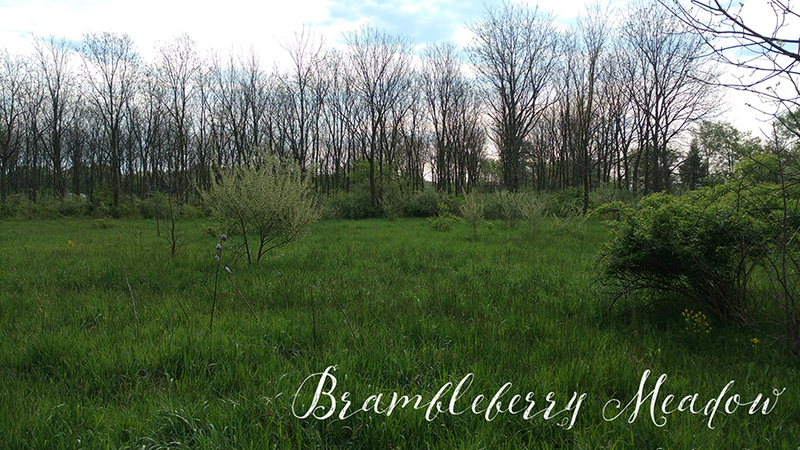 The center is a meadow, with a fencerow containing a sugar bush as the Western border. 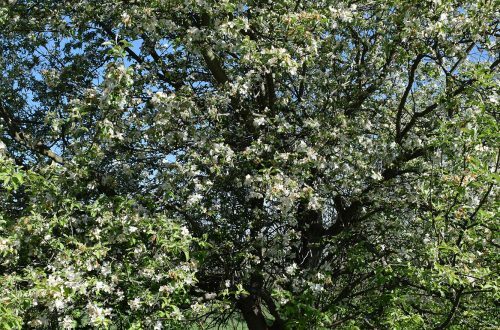 There are a couple wild apple trees. Though it must be admitted that it’s wholly infested with Autumn olives, berry brambles (black raspberries and red, maybe some blackberries as well), and multiflora rose. This effectively gives me a parcel of land that cannot be penetrated easily from any side – a plus when you have children who might be prone to wander. And, since we agreed to purchase it – we had trouble naming this one. Walnut creek? Too Little House. Mockingbird hill? No hill. And I haven’t seen any mockingbirds as yet, though the bird watching is excellent. 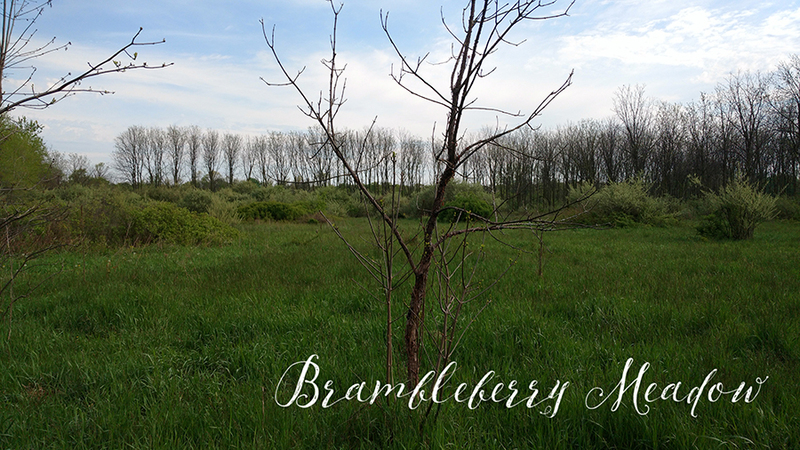 But Brambleberry Meadow seems to fit. 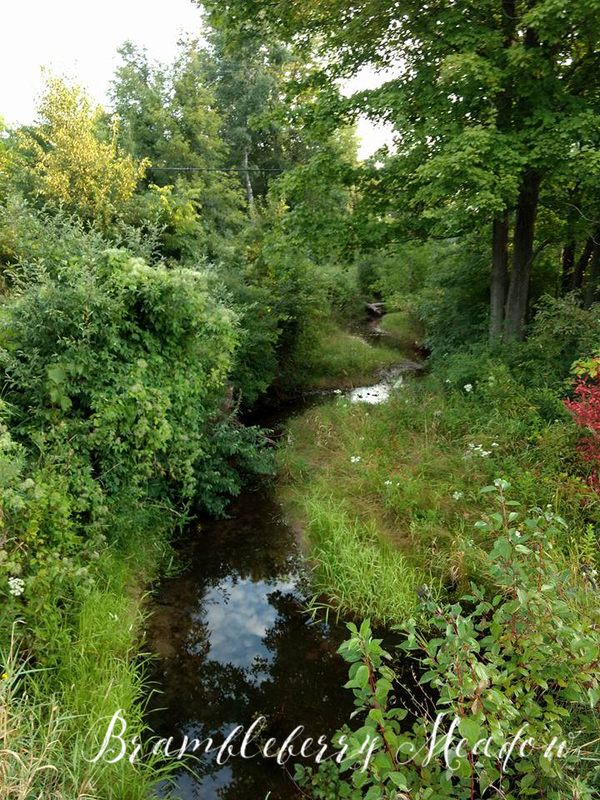 The very Southeast corner is cut by a drainage culvert that functions as a small creek. In fact, despite needing rather a lot of work, it fits the bill for what we were looking for. While too flat for a walk-out basement, and with too high a water table for any sort of basement, it should do nicely for some of the other plans we have. 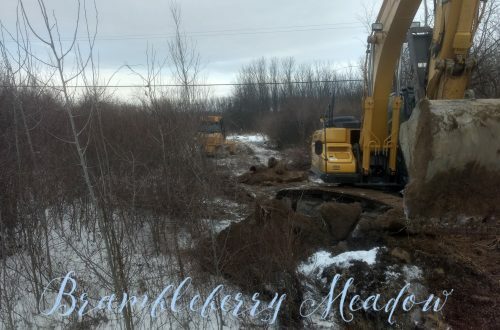 Follow along with the saga of getting a house built, setting up a site plan, choosing livestock, planting trees and gardens, and everything that will need to happen to turn an overgrown brushpile into a small farmstead.